[dropcap][/dropcap]We sat down with head track coach, Don Larson, to talk about the new track facility, good coaching and success. Tell us about the story behind the building process and the remodeling of the BSA. What makes this building a lot more convenient than the BSA? What are some of the challenges with being a track coach at a University where so many other sports are important? What’s the one track and field event, that you can pinpoint, that’s your favorite to run? You also coach Cross Country correct? Track and field and cross country have such long seasons, is it tough to prepare you runners for it? Talk a little about the tradition you have built here. 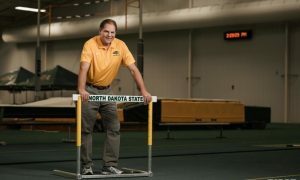 You have been tremendously successful at NDSU, whats your secret? Whats one thing you can point at and are most proud of?